Portfolios can be like closets, accumulating assets over the years. Over time some of them may no longer fit your evolving investment needs. So, like a neglected wardrobe, portfolios need a good clean out from time to time to determine what still works and what does not. As we age, our investment requirements change accordingly. The older we get, the more our portfolio should be structured towards defensive assets and away from growth assets. An investor in their twenties or thirties has plenty of time to recoup any losses. An investor approaching retirement doesn’t have the benefit of time in which to make up for poor performing investments. 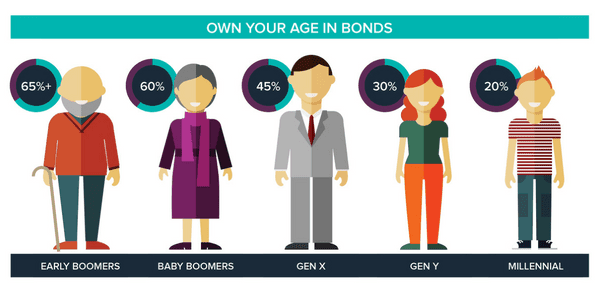 The late John Bogle, founder of Vanguard, coined the phrase ‘own your age in bonds’ as an investment rule of thumb. At the start of your career, a 20% to 30% allocation to fixed income is appropriate. But in your 70’s and 80’s your fixed income allocation should be closer to 70%. Post retirement, capital preservation and reliable income are key. Despite their apparent complexity, bonds are simple investments. It’s simple maths that underpins the rationale for investing in bonds. Understand this, and you’ll likely understand why it makes sense to include bonds in your investment portfolio. TDs are undoubtedly the most familiar and popular fixed income investment. There is currently $932bn1 in household deposits. TDs are loans individuals make to a bank, for a specified period of time, for a set amount of interest. While TDs may enjoy the benefit of protection under the Financial Claims Scheme, early withdrawal of funds can incur a penalty. Government bonds are debt securities issued by the Commonwealth Government. They can provide diversification to a portfolio together with a known outcome and regular income. But, the strength of the Australian economy means that the interest they pay is often low. Hybrids have some attributes of equities and some of fixed income. So strictly speaking they are not considered fixed income. Some investors use them for income and diversification. However, they can behave more like shares than bonds, particularly when the share market is weak. Therefore, their place in the defensive part of a portfolio is questionable. Corporate bonds can pay either a fixed or floating rate of return. Corporate bonds generally offer more return for the additional risk of loaning to a company, rather than a bank. But investors can minimise this risk by sticking with top ASX, investment-grade issuers. Unlike bond ETFs and Managed Funds, XTBs provide a level of certainty for the duration of your investment (subject to no issuer default). Could XTBs be the investment that sparks joy? XTBs are securities which represent a fraction of a corporate bond, traded on ASX. Each XTB is backed by a single underlying bond. So, each XTB effectively mirrors the coupon and face value payments of a specific bond. It’s this one to one relationship that makes XTBs unique. But, unlike the underlying corporate bond, XTBs can be traded in small lots as easily as you buy and sell shares. They provide the predictability of known income and returns before you invest. And with all fees included in the XTB price you see on ASX, there aren’t any surprises to factor in (subject to no default). XTBs bridge the gap between bond issuers and direct investors. It’s quite simple to apply the Kondo approach to tidying your house to your investment portfolio. The ultimate Marie Kondo goal is to manage your investments with minimal effort. Before you start, visualise your destination. Your portfolio should be constructed to help you to achieve your investment goals. Marie Kondo starts by piling the contents of wardrobes onto the floor. In the same way, it’s important to have a holistic view of your investments, so work out exactly what you have. A well-diversified portfolio is spread across multiple asset classes. Diversification is about more than the number of investments held, but rather how each one complements the others. A well-diversified portfolio should have investments performing differently. That’s what they’re designed to do. Every investment you own should have a clear purpose. For example, you may decide that your shares are there for capital appreciation, bonds for capital stability and yield and your term deposits to cover short-term expenses. It’s important to make sure that each investment you have works as hard as it can for you, within the constraints of its asset class. Remember that fixed income is there to provide stability to your portfolio when equity markets are volatile. The Kondo approach of discarding clutter isn’t one we’d suggest for your investments. But, we could all learn from her disciplined approach to categorise and then assess individual items.